Hotel Seiyo Ginza is situated in the exciting Ginza District, Japan's luxury avenue and the financial and fashion crossroads of Tokyo. This location boasts ideal and easy access to Tokyo Station, numerous subway lines, the Tokyo City Air Terminal and Tokyo International Forum. The above fares may change without notice. Tickets can be purchased in Japanese Yen at the Limousine Bus ticket counter at the arrival lobby for the Airport Limousine Bus. Narita Express train tickets can be purchased in Japanese Yen on the basement floor booth at Terminal 1 and Terminal 2. A chauffeur-driven car can be arranged at the time of reservation. The driver will meet the guest at the exit from customs with a name board. Ginza: The nation's most famous shopping district, with long-established and prestigious department stores and shops. At the center of the Ginza is Ginza-Yon (4)-Chome intersection, where Ginza Street meets Harumi-dori Ave. Ginza Street running from northeast to southwest is lined with large department stores, major shops and restaurants. 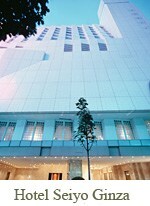 (Hotel Seiyo Ginza is located on Ginza Street). Harumi-dori Avenue leads to the Kabukiza Theater and further to Tsukiji on Tokyo Bay noted for its fresh fish markets. In the other direction, Harumi dori Avenue leads to Yurakucho and Hibiya. A few blocks toward Hibiya from Ginza Yon-Chome intersection is another busy intersection identified by the Sony Building, one of the Ginza landmarks where Sony's products are displayed. The Ginza is a district filled with side streets and fringed by large and small specialty shops, restaurants, coffee shops, and mostly exclusive and expensive bars and nightclubs. Imperial Palace: Open to the public only on Jan. 2 for New Years greetings and on Dec. 23 in celebration of the Emperor's birthday.The Imperial East Garden is now open to the public. Closed on Mondays. Hours: 9:00am - 4:00pm (enter by 3:00pm). A 15-minute walk from the hotel. Tsukiji Fish Market: Eat the freshest sushi at the world's biggest fish market. The auction begins at 5:00 am The best time for tourists to witness the liveliest activity is 8:30am - 9:30am. Closed on Sundays. An 8-minute walk from Tsukiji Street on the Hibiya Line. Asakusa: Visit this old site in downtown Tokyo that is famous for its Temple and Nakamise, a lane lined on both sides by scores of small stores. Meiji Shrine: The sanctuary dedicated to the Meiji Emperor featuring over 20,000 trees that were donated from all over Japan. Visit the Iris Garden in June and the Treasure House. A 10-minute subway ride on the Ginza Line. Omotesando: This wide boulevard set in a modern section of Tokyo is fringed by restaurants, coffee shops, small boutiques and specialty shops. A 10-minute subway trip on the Ginza Line. Ota Memorial Museum: A superb ukiyo-e woodblock print and painting collection - one of the best of Tokyo's smaller, private art museums. Closed Mondays and the 27th of each month. A 10-minute subway trip on the Ginza Line. Aoyama Fashionable: A sophisticated uptown section of Tokyo with trendy boutiques, such as Comme des Garcons, Issey Miyake, Yoji Yamamoto, Emporio Armani and Sonia Rykiel, housed in elegant buildings by architects such as Ando Tadao. Roppongi: This international entertainment quarter, a party town of Tokyo with many discos, is best enjoyed in the evening. For those who are interested in records, WAVE, is a must. A 10-minute subway ride on the Hibiya Line. Ueno: Famous for the spring cherry blossoms, the park contains a zoo, museums, art galleries, a temple and a shrine. Tokyo National Museum boasts the finest Japanese art collection in the world. Closed Mondays. Hours: 9am - 4:30pm. A 15-minute trip on the Ginza subway. Tokyo International Forum: The Tokyo International Forum is in Marunouchi, a primary business hub of Tokyo. It serves as a symbol of a new era for the international. With ideal site conditions, the Forum provides Japan's largest comprehensive culture and information facility. It incorporate a variety of halls, conference rooms, exhibition space and an information center. A 5-minute walk from the hotel. Tokyo Big Sight (Tokyo International Exhibition Center): The Center covers a vast 230,000 meters and features the eye-catching Tower Building, two spacious halls and numerous other facilities making it the ideal site for exhibitions, conferences and other international gatherings. Otemachi, Marunouchi: This central business district is where many Japanese and foreign companies' headquarters are located. A 10-minute walk from the hotel to Marunouchi or an 8-minute taxi ride to Otemachi. © 2016 Hotel Seiyo Ginza. All rights reserved.